Nikole and Ricky’s Anna Maria Island beach wedding featured an oceanfront wedding ceremony, followed by a romantic, outdoor tented reception. The Wesley Chapel couple chose an Anna Maria Island beach venue, and combined a neutral color palette and candlelight to create a romantic atmosphere. Keeping in line with her beach theme, Nikole wanted a natural look for her wedding hair and makeup. 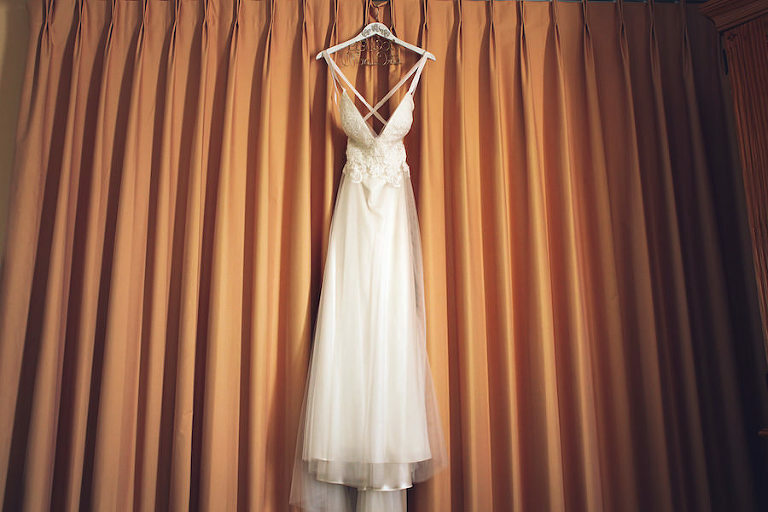 Looking back, one of the bride’s most memorable moments came during the wedding ceremony. I wanted to look like myself, but not too done up to the point my husband didn’t even recognize me. Lasting Luxe is owned and operated by Michele, who was a sorority sister of one of my bridesmaids, so when I was [looking for a hair and makeup artist], I did a trial with Lasting Luxe. Michele was able to create exactly what I wanted. She uses high quality makeup and airbrush, which was perfect for an outside beach wedding. She also was able to come to the hotel and provided both hair and makeup which was much more convenient than hiring two separate people or having to worry about going somewhere. Her prices are very reasonable, and she’s just a really nice girl to work with. I didn’t feel awkward getting ready, she just fit in with my bridesmaids and me which I really liked. If someone is going to be in your face for a couple hours the morning of your wedding, you want someone you can get along with. I was looking for the perfect minty color. I have seen mints that are more green or more blue; I really wanted something pastel and light but definitely not aqua. I found Joana August and loved how flowy their dresses were. I saw Bella Bridesmaids carried the designer, so I went with one of my bridesmaids to make sure I liked the color, which I did. From there I told my girls that I didn’t care which style they choose, because I kind of like the mismatched style, but I just wanted the girls in the same color. Bella Bridesmaids was very easy to work with, and their in store stylist was super friendly. They are a national company, which was a huge plus because the girls could just go to the store in New Jersey and try on whatever they liked. They shipped the dresses here to Florida, which made it easy for the girls to not have to travel with their gowns. Romantic, with lots of candles, intimate, and chic. I wanted our ceremony to be beachy, but more glamorous than nautical. We had chandeliers and vintage furniture; it wasn’t your typical beach wedding with starfish and aqua and coral themed colors. Everyone who knows me knows I love gold, so that was a must, and I wanted lots of white too. I found myself really drawn to garden and vintage themed wedding ideas, so I wanted that combination of natural greens and vines tied in with vintage gold glam. Neutral sand colors: tans and browns and greens: minty and kelly green. Gold, white, blush. Ricky completely surprised me at one of our favorite places, Lido Beach and St. Armands Circle. We went for a day of Christmas shopping and to get lunch, a tradition we have done for the past four years. At the end of the day, we decided to go for a walk on the beach to watch the sunset. We sat down in the sand, and Ricky proposed with the most beautiful ring. He planned out the whole thing down to making dinner reservations for us at our favorite restaurant on the circle to celebrate with champagne to getting us a hotel suite at the Lido Beach Resort for the evening. It was absolutely perfect. I needed someone to keep me organized and let me know if I was forgetting anything. I have a very specific style and taste, so I always knew what I wanted; I just needed someone to execute my vision. I also wanted someone who wasn’t going to constantly come to me with questions, but figure out the problems on their own. Ashley [of Exquisite Events] was incredible! She was everything I wanted and more! I would recommend her 100 times over to any bride. She was organized, met us at different sites and helped with time lines, but she was also laid back, which I liked. I never once felt concerned about the day of our wedding or how things would flow. The day ran flawlessly thanks to Exquisite Events. It sounds cliché, but the day really does go by so fast, so try not to sweat the small stuff and really enjoy the day with your husband, because that’s really what it’s all about. Whitney and Tavarus hosted an intimate destination wedding on the sandy shores of Pass-a-Grille Beach. “The most important element of our wedding was the sand ceremony, because we wrote our own vows, and since it was our second wedding, it meant the most to us. It symbolized our love for each other,” the bride beamed. As a nod to the Tallahassee’s couple first wedding together, the chose a bright, tropical color palette. 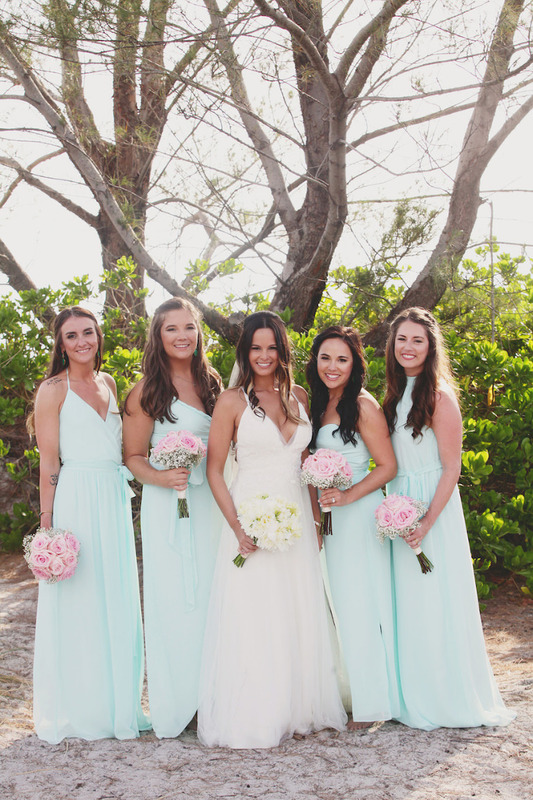 With the help of destination St. Pete wedding planners Tide the Knot Beach Weddings, the couple was able to leave the logistics behind and focus on celebrating with each other. 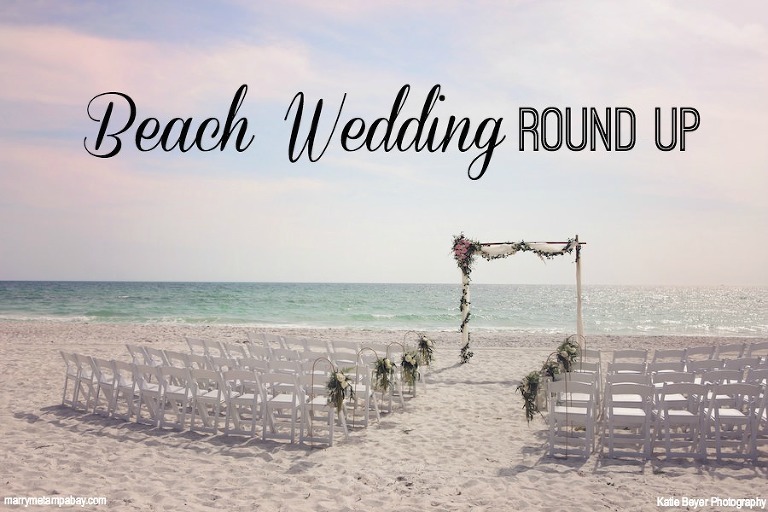 “Tide the Knot Beach Weddings does beautiful work, and they had great reviews. They did everything and made our wedding day perfect,” the bride gushed.